Second Annual Film Industry Mixer and Belligham Commercial Awards. Dec 8th 6pm to 9pm @ Pickford Film Center. On behalf of Bellingham Film, it is with great pleasure to invite you to our Second Annual Film Industry Mixer and Bellingham Commercial Awards (BCA), 6:00PM on Sunday, December 8th, 2015. This annual event of filmmakers and local business representatives is an opportunity for discussion of the future of commercial media in Bellingham. Presentations from Washington FilmWorks will include the mandatory Innovation Lab Info Session along with a Film in WA Update. We encourage discussions on the advantages of a multimedia campaign and the increasing affordability of video advertising. Additionally, a mixer for attendees will take place in the Pickford lobby with the first round of drinks courtesy of Hand Crank Films. We have a few ways we can help you promote your business through our event. 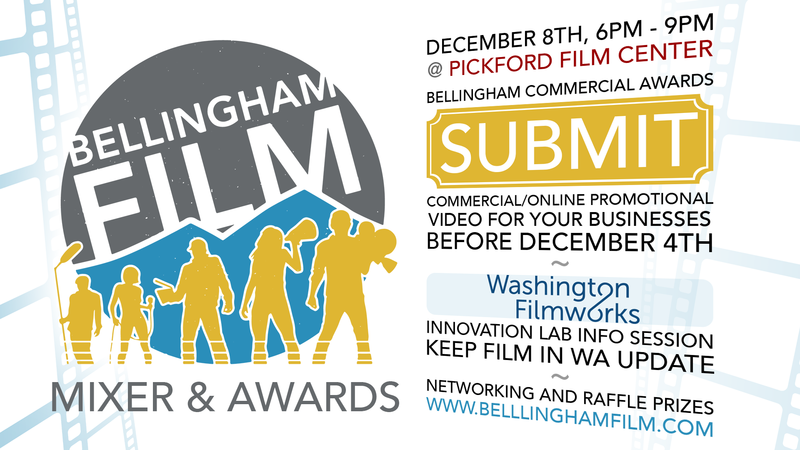 Submit your favorite commercial to the Bellingham Commercial Awards. Donate a product or service to our Raffle. Rent a table and display your products and services. Become a sponsor and get exposure on our website, social media, newsletter and at our event. This event is a great opportunity to discover what commercial projects have been produced here in Bellingham as well as creating relationships for future ones. As an exciting new addition this year, two BCA awards will be presented to the best commercial endeavors of 2015. All this, as well as a raffle and a little bit of fun in time for the holidays. Mark us on your calendar and plan to join us On December 8th.